Who would have thought that a Mall could be a huge tourist drawcard. Well if that mall is in Dubai then it sure is indeed. The amazing Dubai Mall is by no means any ordinary Mall and you won’t find anywhere else in the world quite like it. 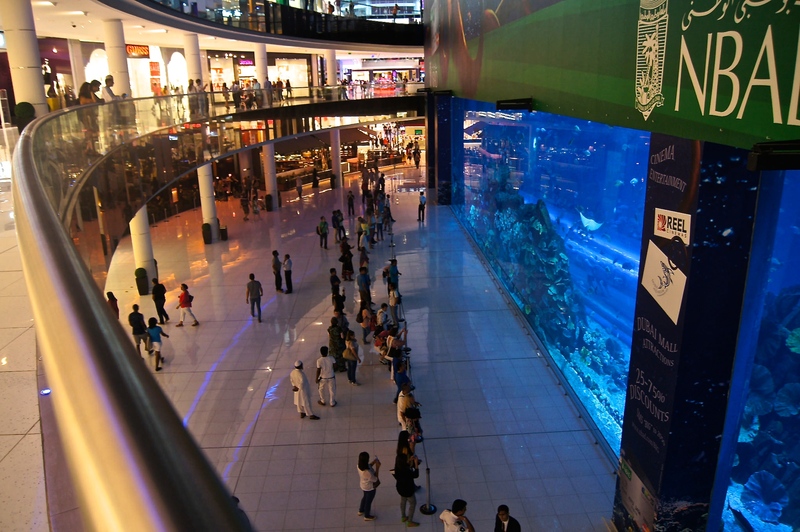 The Dubai Mall is not only about shopping up a storm but there is plenty of unexpected things to see and do whilst you are there. You could easily spend the whole day in this mall, so check out below on how you can plan your day around this mega shopping complex. There is no excuse for not being able to find that special item as there is literally 1200 stores. 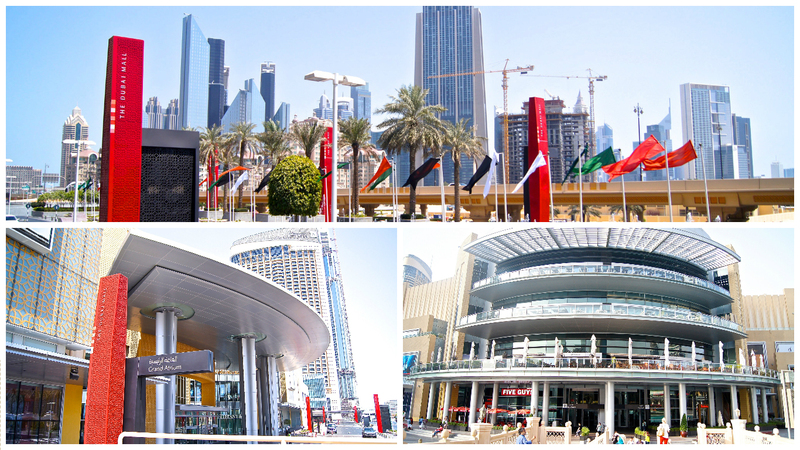 Here you will find every type of item or service that you will ever require – you name it and you will find it at the Dubai Mall. If it’s fashion you are after then you will find everything from Chanel to Cotton On, as well as everything in between. There is the fashion Avenue wing that houses high end couture and there is also a catwalk for fashion shows. The dome where Fashion Ave you resides, where you will find high end couture. There is a section where you can find traditional shopping in the Souk. 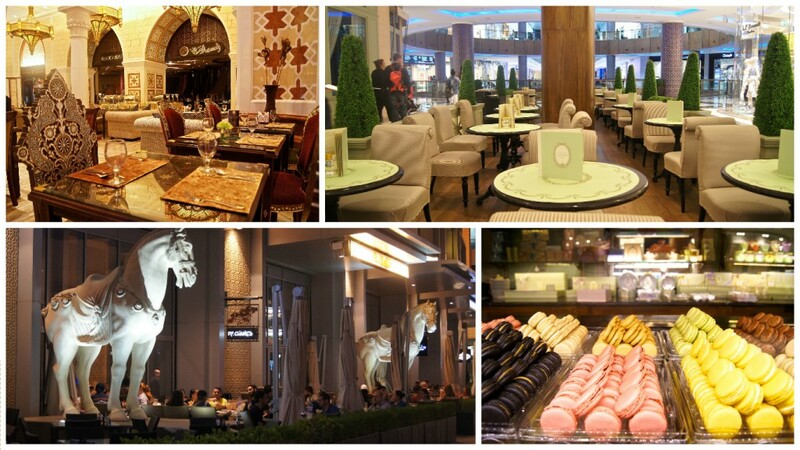 There is an amazing array of dining options at the Mall, from casual to the very up market dining. Taking a coffee or a hot chocolate break can be done in style with both the famous Paris cafes Angelina and Laduree both offering tempting treats. 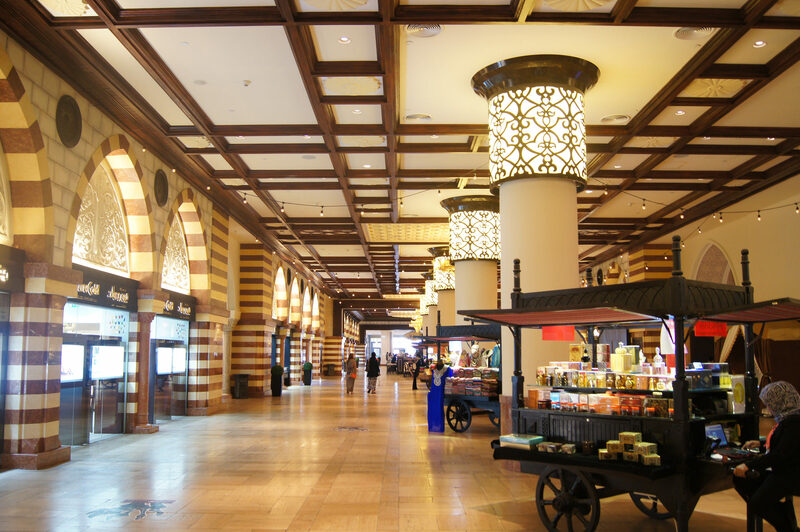 Traditional arabic cuisines can be found in the Dubai Souk, alongside other famous restaurants like America’s The Cheesecake Factory. 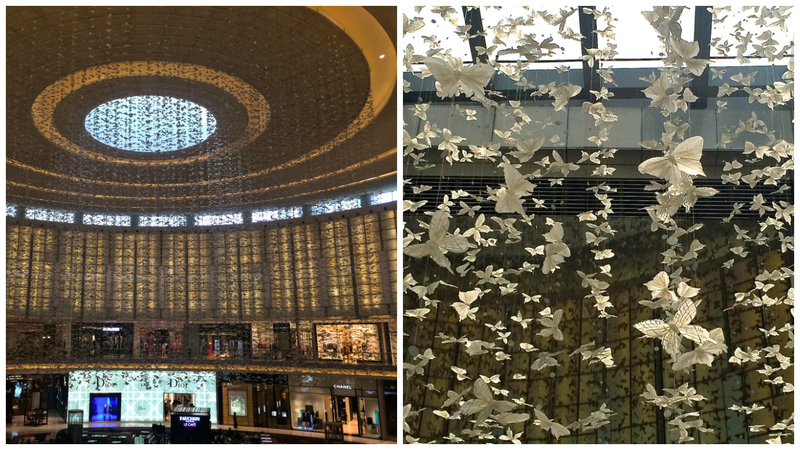 The Dubai Mall is full of interesting architecture and objects of art. 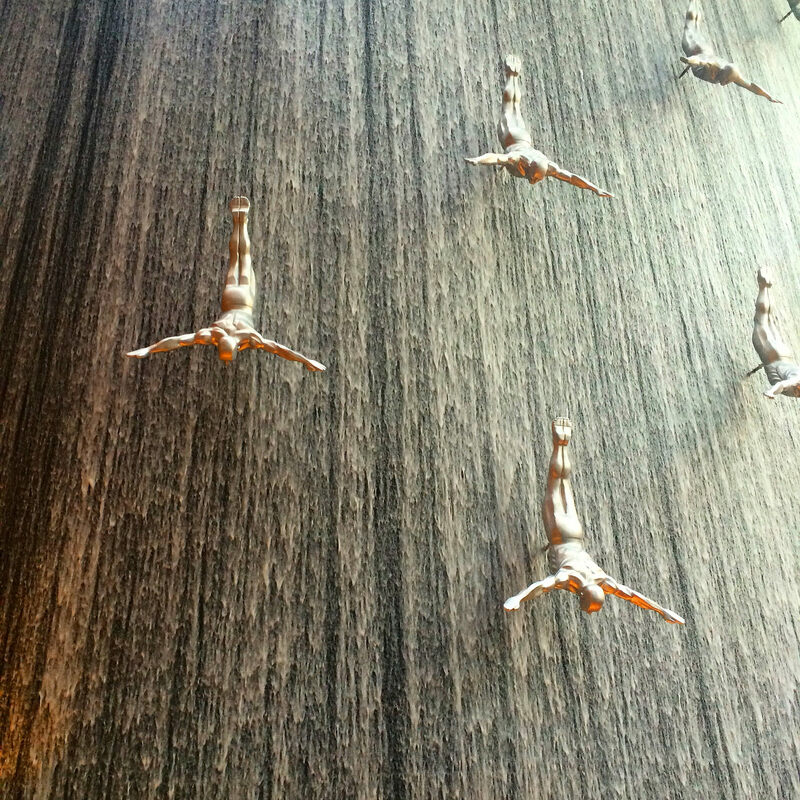 At one end of the mall is the waterfall depicting divers. The waterfalls flow from three levels high. 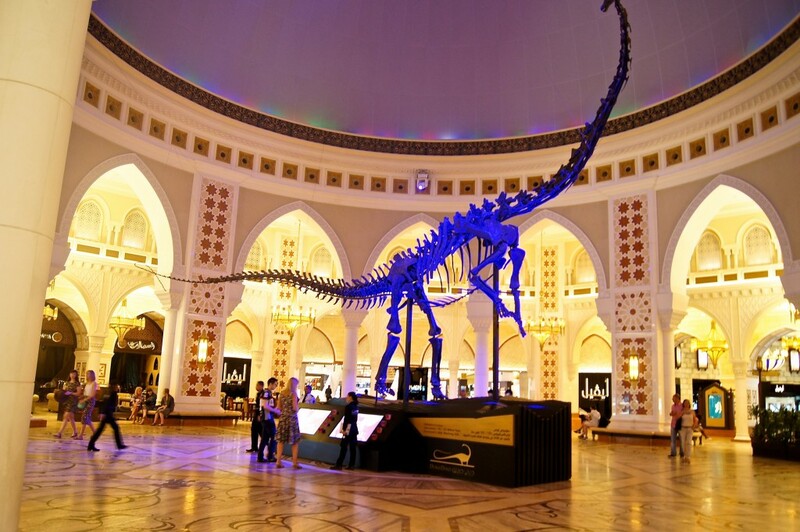 Located in the traditional shopping area of the Souk, is the imposing Dubai Dino. It’s 24.4 metres long and 7.6 metres high. The skeleton was discovered in 2008 with nearly all bones intact in Wyoming and transported to Dubai. It’s over 155 million years old. A world just for kids. A mini city where the kids get to experience the world through adult eyes (and responsibility). 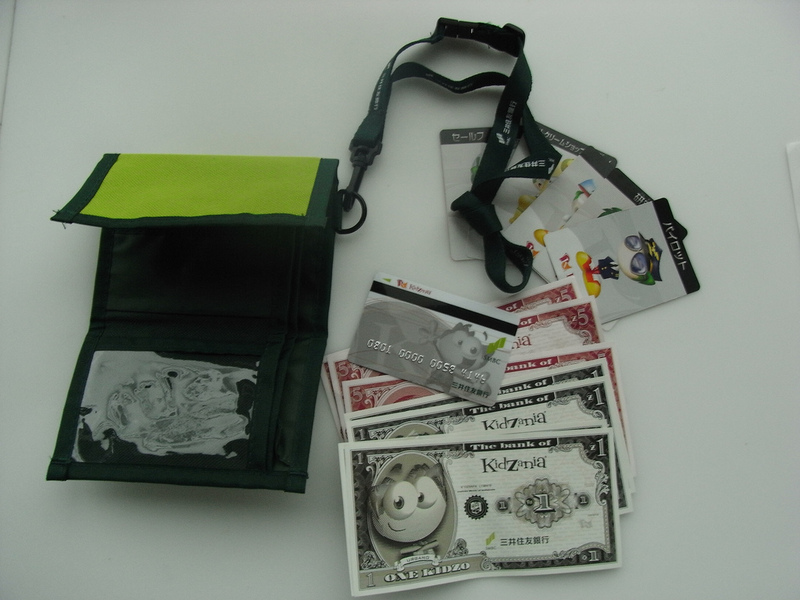 Kids take on adult jobs to earn ‘Kidzo’s to spend on what ever they like in KidZania. When they run out of money they have to go and find a job in KidZania to earn more. There are all types of jobs available in KidZania just like in the real world, from banks to McDonalds, from cleaners to surgeons. 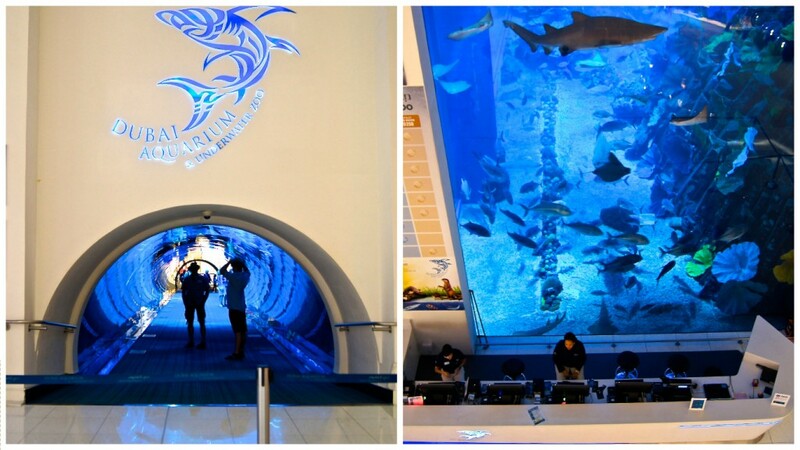 The Dubai Aquarium and underwater Zoo boasts the largest viewing panel on earth. There are over 33,000 aquatic animals residing here, including sharks and stingrays. Underwater zoo, glass bottom boat rides and shark dives. 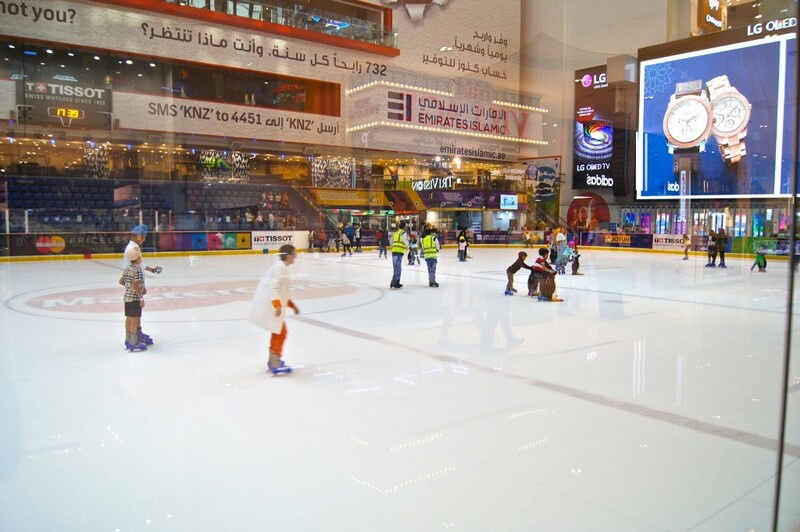 The Dubai ice skating rink is Olympic sized and holds learn to skate programs for beginners. The venue also hosts events for figure skating, ice hockey and ice shows. Fancy catching a blockbuster movie? Well do it in style at the Dubai Mall with Reel Cinemas. The cinemas at the mall offer a platinum service where you will be treated to a bit of luxury with your own private reclining arm chair, table and personal butler service at the press of a button. Whether you choose Platinum or not, you will be able to experience the Dolby Atmos surround sound system that flows around you. Perhaps you have some bored teenagers who don’t fancy tagging along when you are shopping up a storm. Send them straight to Sega Republic whilst you shop or perhaps join in on the fun! There are 15 rides and 100s of games to be played in this indoor theme park. From adrenaline pumping activities to toddler areas there will be something to entertain the whole family. 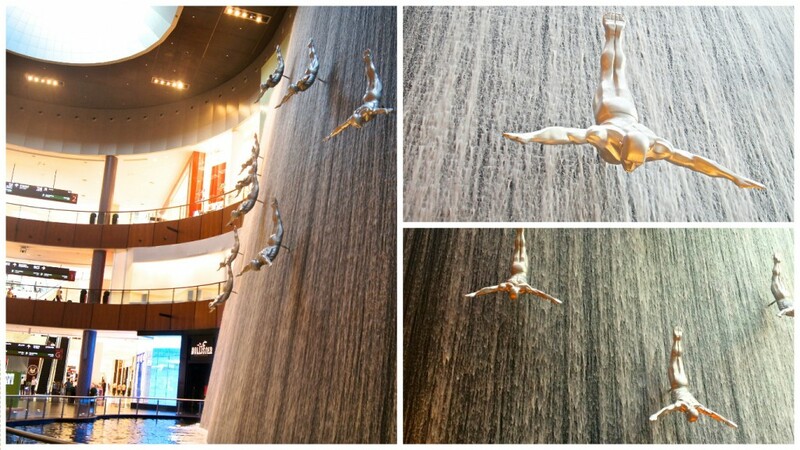 Located right outside the Dubai Mall. 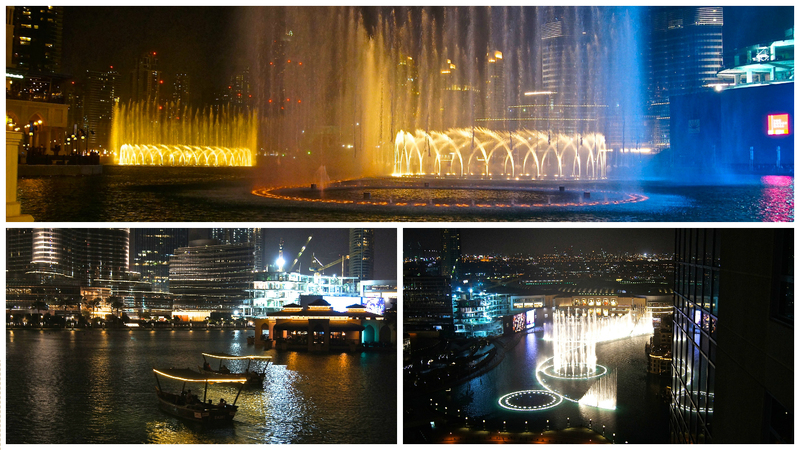 A fabulous water, sound and light show. The water sprays 150 meters into the air. Over 6000 light and colour projectors. You can even take a ride in a traditional agra and sail around the lake getting closer to the show. Shows run every 30 minutes after sunset, along with 2 shows during the day. Make sure you pick up a map of the mall to find your way around. 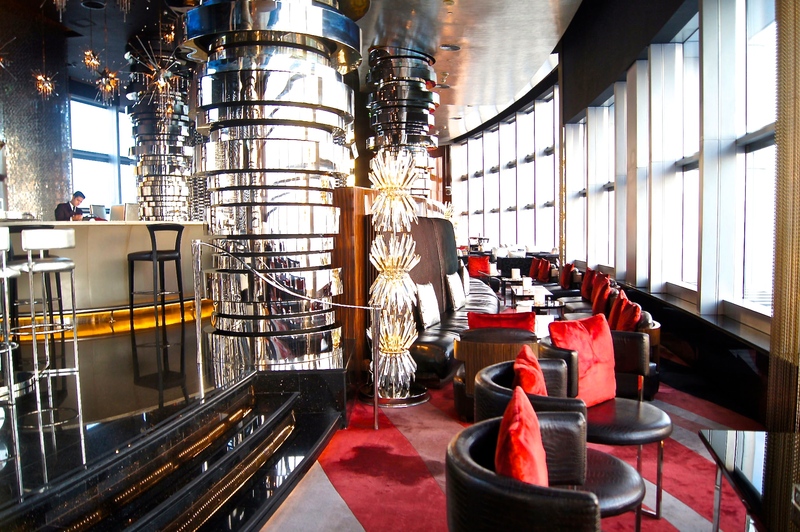 The Burj Khalifa is located right next door, so you can also take the opportunity to take the ride up to the sky deck for a view over Dubai.